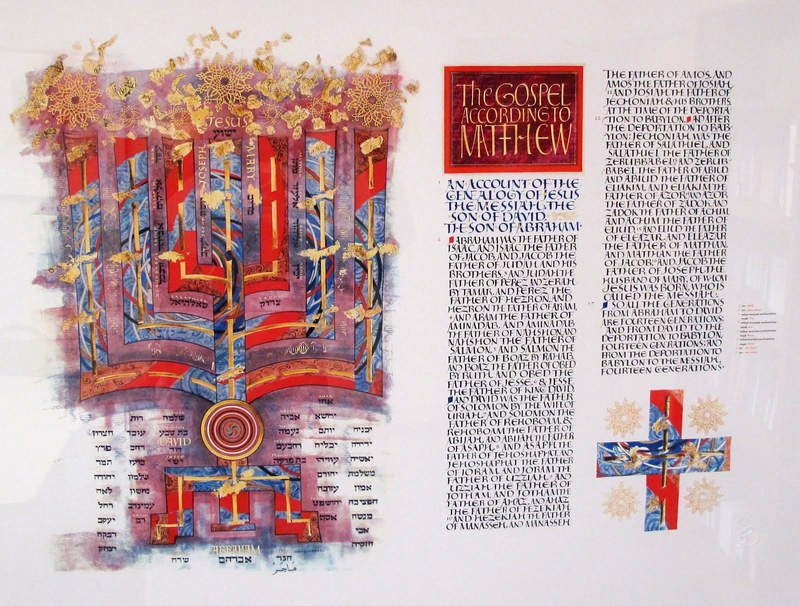 The weekend of November 5th I was scheduled to go to the New Mexico History Museum to do some demonstrating for the exhibit of the St. John's Bible. Well, true to New Mexico style, a road worker decided to dig up a main power line causing a blackout at the museum and the demos were cancelled that day. Fortunately, the lecture and presentation the following Monday were not. 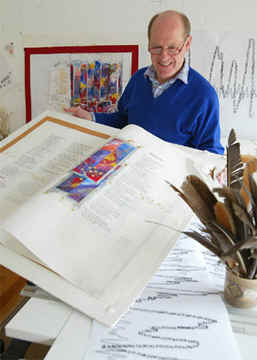 The St. John's Bible was an idea that germinated in 1995 as Donald Jackson, England's preeminent calligrapher to the Queen, proposed the project to the St. John's College board of trustees. After signing a contract in 1998, artwork on the 15 year, $12 million project was begun. 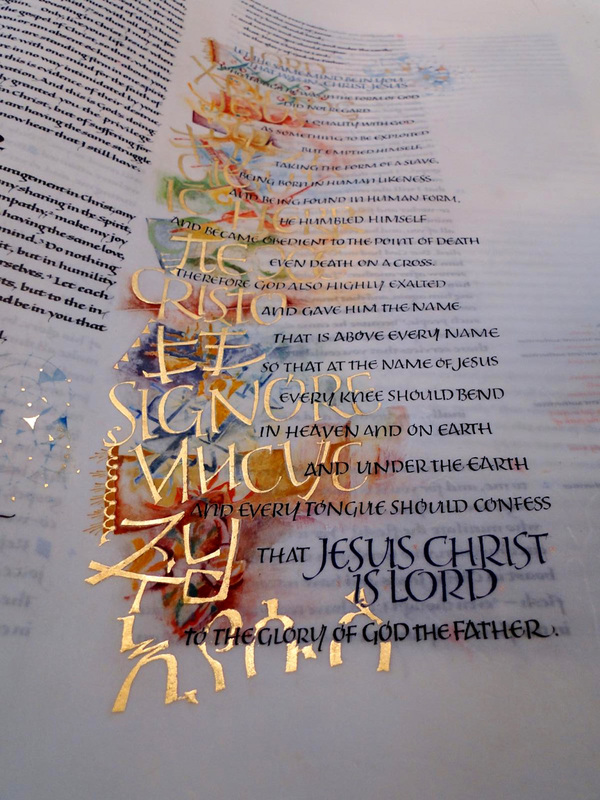 Reaching it's culmination in 2011 with the final book of Revelation, this multi-volume hand lettered and illuminated work of art is magnificent to behold. The St. John's Abbey in Collegeville MN is founded on Benedictine principles. 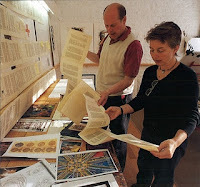 They assembled a multi-faith team consisting of "artists, medievalists, theologians, biblical scholars and art historians¹" to provide background and direction to Jackson and his team for each illumination, though the artistic execution rested ultimately on the shoulders of Jackson and his chosen artist-illuminators. The bible itself was constructed using both ancient and modern techniques; the huge folios are written on calfskin vellum using goose and swan quills and 19th century Chinese stick ink. Text layout and some design were done utilizing computers to make sure that each scribe knew where the text was supposed to end on each page, since these were all written in loose folios. With a goal of making the work a relevant one for the reader of today, the illuminations (illustrations of text) incorporate contemporary imagery and bold graphic quality that are executed with astonishing skill and confidence. These artworks are even more impressive when it is considered that they were done after the pages of text were written, leaving no margin for error. Donald Jackson came to Santa Fe's Lensic theater to speak about the project and the associated exhibit. In his hour long talk he spoke of the process of the written page, having four main scribes learn a common script that was developed to allow ease in modern readability and yet impart an sense of the sacred to the text itself. "Calligraphy is something that visually gives words importance" he said in his lecture, and Jackson certainly seems to have a sense of this project and it's place in history. 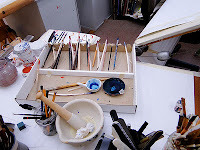 He spoke of the communication that happens between the artist and an artwork as he tried to apprehend the text to be illustrated, and bring the artwork into contemporary understanding. An example is the "Revelation" folio below, where the valley of dry bones shows not only bones, but human industrial detritus as well such as one might see in a junkyard. 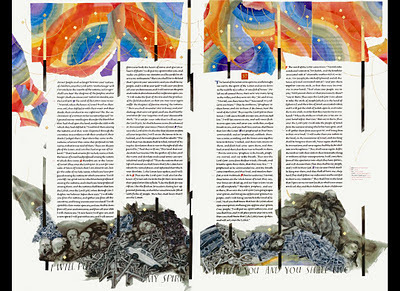 Jackson and his artists used recurring, modern themes as imagery throughout the work, such as the textured DNA framework in a gold leafed pattern that pervades the genealogy page of the Gospel of Matthew from background to foreground in layers of artwork with depth and complexity throughout the stylized menorah. 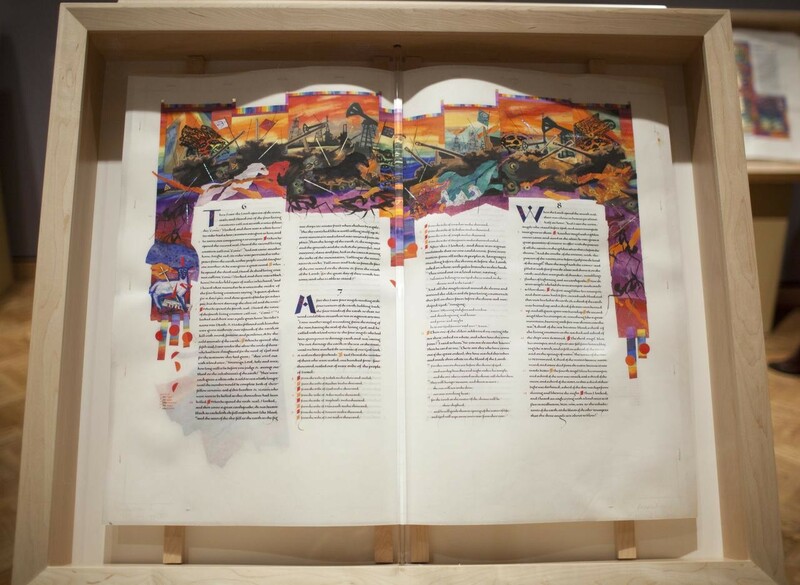 The exhibit itself at NMHM is one of the best I could conceive of, with curator Tom Leach taking a personal interest in having brought the bible to the museum after a 6 year negotiation. The current exhibition is titled 'The St. John's Bible and The Contemplative Landscape", and is exhibited in the round with a circular configuration of interior walls. The bible is displayed along with an exhibit of photography of a contemplative nature that compliments the spirit of both bodies of work. 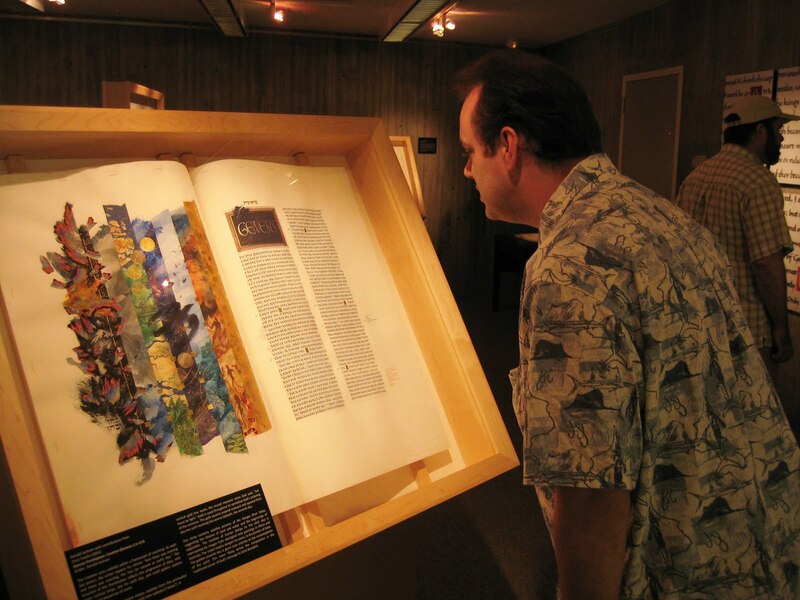 Cases were constructed to exhibit the Bible folios that allow a viewer to get very close to view details of the works. The use of gold, according to Jackson, catches a viewer's attention, and gives a sense of importance to the text. It asks a question and invites exploration into the meaning of it's use. Indeed, as one walks through an exhibit such as this, the eye is continually attracted to the next case as the gold changes in the light the closer one gets to the next artwork. I was impressed not only with the St. Johns Bible artwork, but the conceptual quality of the thought behind the work. Commentary is made through imagery of our world today and also into the consciousness of the preservation of the planet. The folio below of armageddon shows not only the horrors of war but also some of the roots of war and the degradation of our atmosphere and environment, combining biblical plagues with images of oil wells and modern tanks. It is not often that I long to return to an exhibit to study imagery more, but this is one that I will return to again. 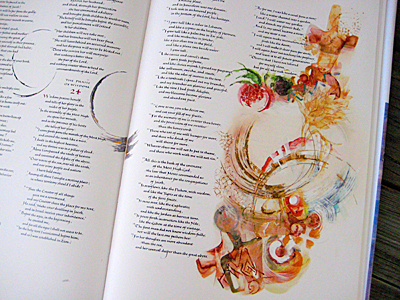 Many Artists and Calligraphers were a part of this project, including Americans Thomas Ingmire, Diane Von Arx, and Suzanne Moore. Friend Izzy Pludwinski of Israel was also involved in the titling of the books of the Tanach. Yes Cari, that page is amazing, and your's was the best picture I found... thanks for posting. I am happy that you did! This is one my favorite illuminations in the books. I purposely did not add my name in copyright to the metadata to avoid confusion so it went on my blog as a public domain image. 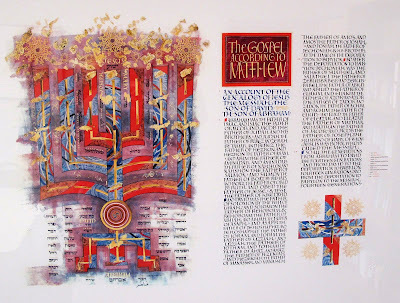 I love that image of the page with gilding going from Latin into Greek? letters. Wow. 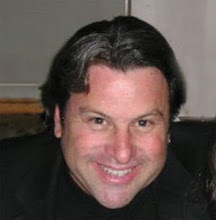 Thank you Randall for your excellent commentary. My husband and I were fortunate to see this excellent presentation at the Tacoma Art Museum in Washington in 2009.